I know a lot of people use straw wreaths but all the ones my Michaels had were rather pitiful and misshapen so I went with a floral one instead. They also had a ton of yarn on super sale this week, so I got both skeins for $4. I tied the end of the skein onto the wreath and simply started wrapping. And then wrapped some more. A lot more. At the end of the one skein, I tied the two together in a small knot and added in the second. I wanted the wreath a little thicker than the original form, so I finished using the whole second skein even though I’d finished covering the green part already. Next up came making the flowers. While my Felt So Cute felt flowers are fun to make, I wanted something a little more minimalistic for a door wreath. 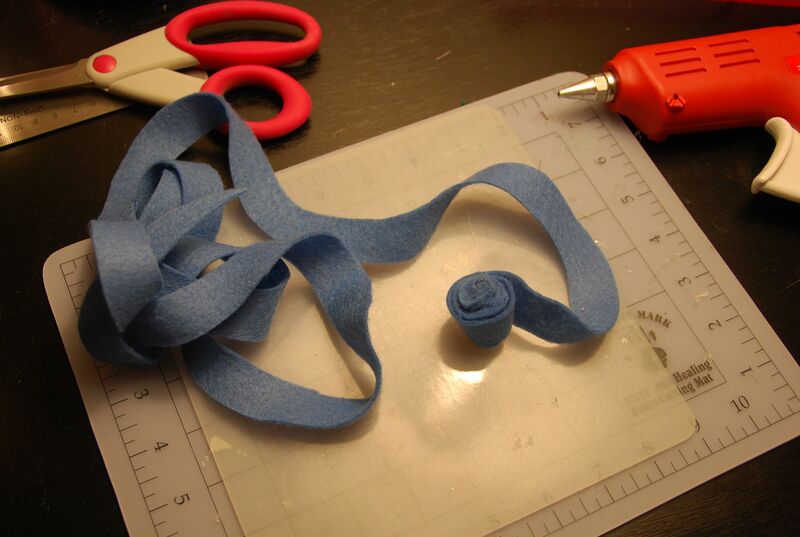 So I went back to easy spiral flowers like I learned at summer camp years ago. Start with a basic circle in a variety of sizes. And yes, that’s my second chai latte of the day. Wanna make something of it? 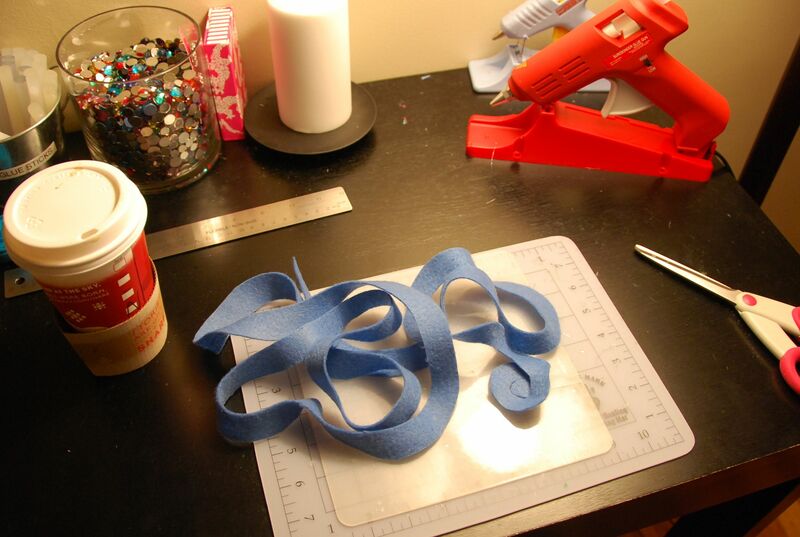 Start cutting in a spiral about a half inch thick until you get to the middle. Then start at the middle of your spiral and start wrapping tightly. 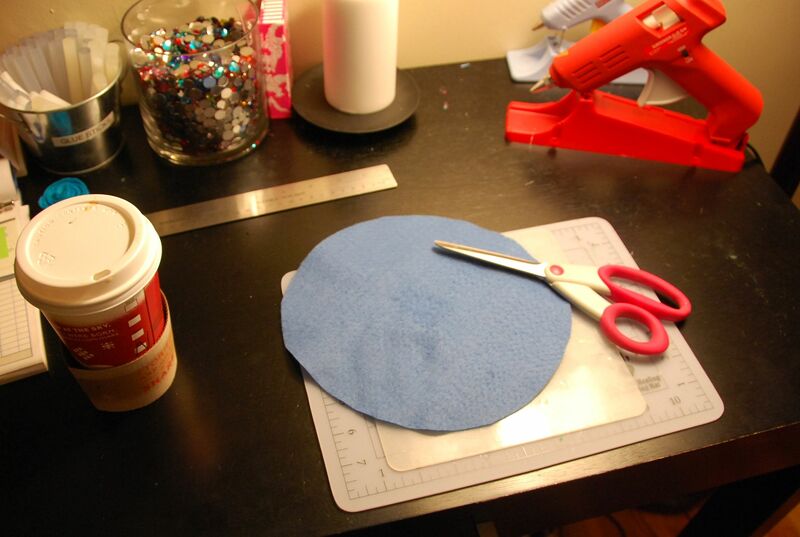 Every now and then add a bead of glue from your glue gun. Play around with different sizes and placement until you have what you want, and make the decision whether or not you want leaves. Then simply glue gun everything in place directly onto the wreath. 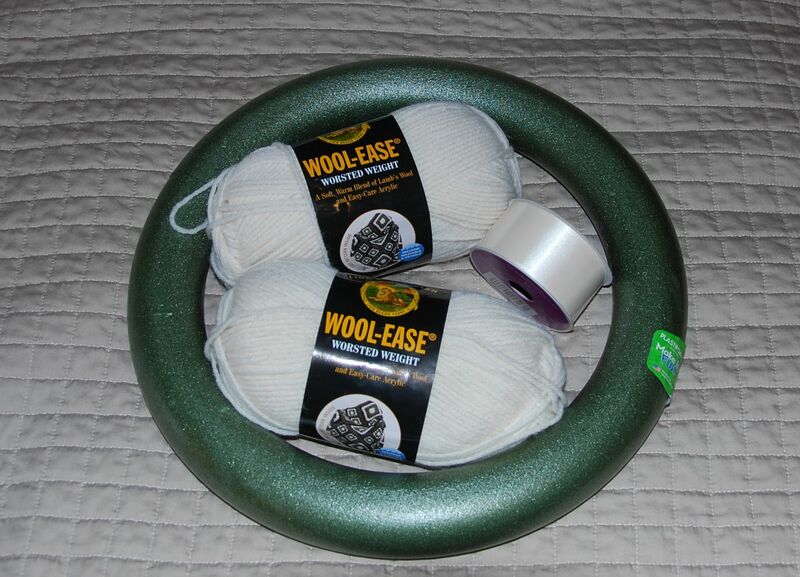 I then took some satin ribbon the same color as my yarn and tied a long loop around the wreath and a bow. So easy The Cuties helped make flowers! The whole thing cost less than $10, and now I can think of all sorts of other ideas for Valentine’s Day, Halloween, etc! This entry was posted in Craft Projects, Decorating and tagged crafts, decorating, felt, hanukkah, holidays, how to, ribbon, wreath. Bookmark the permalink. gorgeous! thanks so much for sharing on Craft Schooling Sunday, great to have you! You’re right, love the clean, simple look of it on your door, so very elegant. Great colors, and so simple.. Loves it. That is great! Can’t wait to give it a try. Love it!! I really love how the blues of the flowers pop against the white wreath. I love that you made this out of yarn. Beautiful! Such a pretty wreath! Great job! 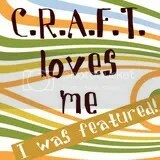 Wish I was crafty like that! 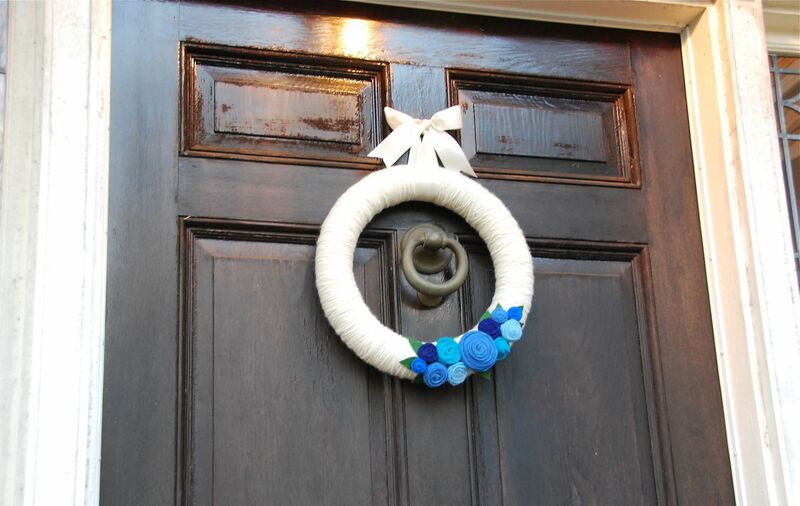 This wreath is beautiful — I love the different blue hues. It is so nice seeing other Chanukah project ideas online! Thanks for visiting my blog, too. I’m your new follower. Very cute and simple. Love it! Super cute – great tutorial! I LOVE this wreath! Adorable! I am just obsessed about felt right now. Thanks for visiting my blog – you have to try the felt garland- it is so fun and happy and really relaxing to make…just relax, watch a movie, and stitch away! I haven’t seen you for a bit so I checked here and I’m so glad I did, what a fun idea! I had a gift for a friend sitting here and decided to decorate w/ the felt flowers and it turned out so cute! I’ve never made these before, I’m excited to have learned. Thanks for sharing! Hope you’re doing well. really cute….this is easy enough for my kids to even help…. I love this!! Yarn wreaths are so cute. I love how simple yet elaborate it is. So pretty! I love that you can use this all winter! Just Darling! Thanks for the tutorial! The wreath looks absolutely lovely and you did a fabulous job. I hope to see much more of you in the future! Hi! I found your blog through Kelly’s Korner and just love it! I LOVE all of your crafting ideas and your house is beautiful. As someone who is not married, does not have children and doesn’t even own an house (but looks forward to the day when I will have all of those) I am storing MANY ideas away until later! Oh- I’m also not crafty, but your blog has inspired me to try! Haha! I LOVE this wreath and want to attempt to make one (which is huge for me) but have a question…what do you do about snow/rain, etc.? Perhaps you have a storm door as well…but if not, does it hold up? Erin ~ what kind comments! Thanks so much, I’m touched! (I too, had many idea files, long before Cute Husband and The Cuties came along!). The wreath has held up just fine and we’ve had some bad rains and winds so far but no real snow yet in New England to date. However, we do have a good covered foot or two from the eaves above the front door that offers some protection and anything else I’ve ever had on the door has fared just fine so I think we’ll be OK. Thanks for your reply…I am a fellow New Englander, so I am glad to hear that your beautiful wreath has survived all of the rain we have had! Also, I just realized in my last comment I said “an house” and it’s driving me crazy. Clearly I meant “a house.” Ha! 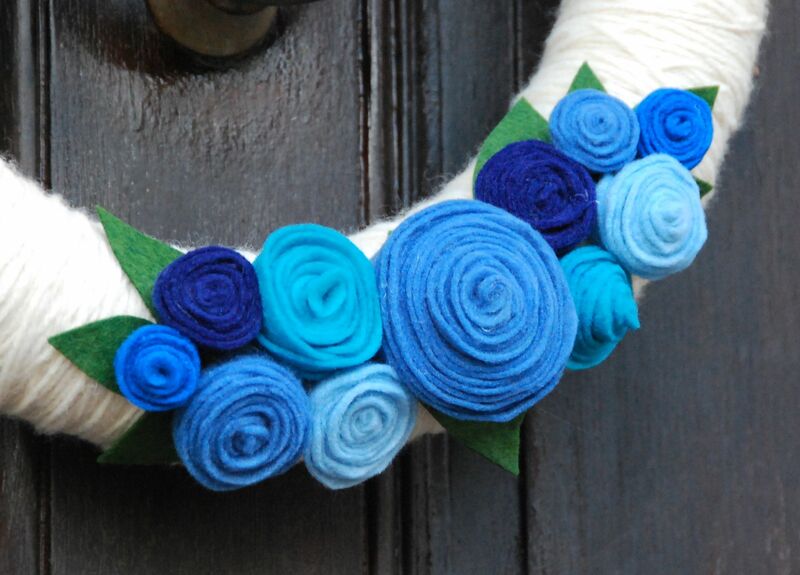 a fellow crafter pointed me in the direction of this tutorial and oh my goodness, this is the most adorable wreath!!! as soon as i saw it, i raced to michael’s to buy my supplies, and i am happy to say that 24 hours later, my wreath is hanging from my door. i love it!!! i posted pictures on my blog and also put a link to your tutorial. 🙂 thanks for sharing!! Your wreath is just beautiful! I just made my first yarn wreath ever. I might’ve copied yours if I’d seen it before I finished mine 😉 You could leave that up all year long! Saw you at Fingerprints on the Fridge! I followed your tutorial and recently made my own yarn wreath. Thank you for the inspiration! I adore the colors that you used! Fabulous!!! I love how the felt rosettes pop!